Among Futura owners the term Wiring Mod refers to a specific modification done to the charging circuit of the bike to improve the charge rate, counter the problem of the melting brown connector (and the associated fire risk) and improve starting performance. It shouldn’t be confused with any other modifications to the bike’s wiring loom. In short, the mod involves removing the brown connector and soldering or crimping the wires together, and running extra wires from the regulator/rectifier to earth and to the two green fuses next to the starter solenoid. Since Hansb first came up with the fix, hundreds of owners have done this mod or a variation of it. If you have a used bike, the mod may already have been done, or the brown connector may simply have been eliminated without the addition of the extra wires. The only way to find out is to test the voltage as described in the charging system page. You’re looking for a rate of 14 to 14.5 volts. 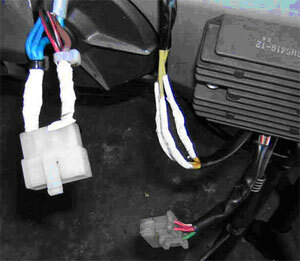 The Wiring Mod is a way of getting round the poor performance of the regulator/rectifier. This component converts the alternator’s output into a steady voltage to charge the battery, generating a lot of heat at the same time. It’s this heat that helps melt the connector, though oil often finds its way into the connector and that can’t help. These days aftermarket regulator/rectifiers are available from several sources, though the connections at the brown and white connector are still suspect and need improving. But fit a new one and the charge rate increases enough to be acceptable without the need for extra wires. If you do both you’ll risk the bike overcharging. So the upshot is EITHER do the Wiring Mod as described, OR fit an aftermarket regulator/rectifier and solder the crimps in the connectors. And remember: Before you do any soldering on the bike, disconnect the battery negative lead, or you’ll blow the 30Amp fuse next to the battery. The bike will still run, but a whole load of weird electrical things will happen. See the regulator/rectifier page for more information or click on the link below for Bossbob’s guide on how to do the Wiring Mod.